UNITED NATIONS, October 17, updated Oct 18 -- As the UN reacts to calls to cut its budget, its "post reductions" are disproportionately directed as lower level staff, who accuse Secretary General Ban Ki-moon and his administration of a lack of transparency and even honesty. Inner City Press has obtained a copy of a member from Ban's top Management official Angela Kane which tells Departments to start preparing for cuts, even before the UN General Assembly considers them, and provides for the termination of staff with "permanent" contracts. Click here to view. "The post reductions in the New York Printing Section are contained in the Secretary General’s proposed programme budget for the biennium 2012-2013. They are expected to be achieved through attrition and other management measures, i.e. without involuntary redundancies." "I am writing regarding the abolition of posts proposed in your department/office for the biennium 2012-2013. As you know, the final decision on any abolition of post(s) rests with the General Assembly. 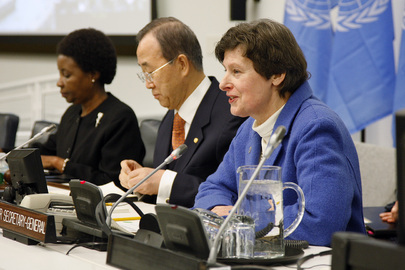 In the event that the General Assembly does approve the Secretary-General's proposals, certain preparatory work should be undertaken by each department/office with regard to the staff that will be affected by the abolition of their respective posts... staff members who hold permanent appointments must be given three (3) months written notice of termination of their appointment." "The Secretary-General's final budget proposal assumes that 37 TC posts and 4 GS posts will be abolished in the PS... processing of publications currently processed on offset machines will be outsourced... The 2012-2013 model implies that 81 posts need to be abolished." One of the addressees, Narendra Nandoe, is said to be "sabotaging" the Publishing unit by refusing to order supplies or allow small errors to be fixed. So it goes at this UN. Inner City Press: yesterday, people working in UN publishing were told that 41 of those cuts will come from their department — 37 posts and 4 trades and crafts. I wanted you to confirm if that’s true, and they wonder, and I also in turn wonder, whether this idea of totally phasing out publication and laying those people off is something that’s been checked with Member States in terms of them using things like the Journal, and the various things that are printed by the UN, including reports. Is it true that 30 per cent of the cuts are in one division and why is that the case? Spokesperson: I’d have to check on the details of what is a budget submission and a budget submission that goes to the Member States and is approved by Member States. If I have anything else further, then obviously we can let you know, but I think that’s an important factor here. Inner City Press: I don’t know whether they are called lay-offs or post eliminations, will these, before they’re implemented, require the approval of the Fifth Committee? Spokesperson: I need to check. But if it’s a budget submission, then a budget submission needs the approval of Member States. Inner City Press: they were told, I don’t think it was said in either in the Fifth or ACABQ, I think it was said by the UN Secretariat to publishing people. Spokesperson: As I say, I need to check. Then for ten days, the UN did not provide a response. But documents came in. Watch this site. Footnote: meanwhile the rest of "Kane's reign" bears marks of decline, down to the smallest and most simple things. Monday delegates groused that they couldn't even print, with the computer printer on the North Lawn's second floor left again without paper. 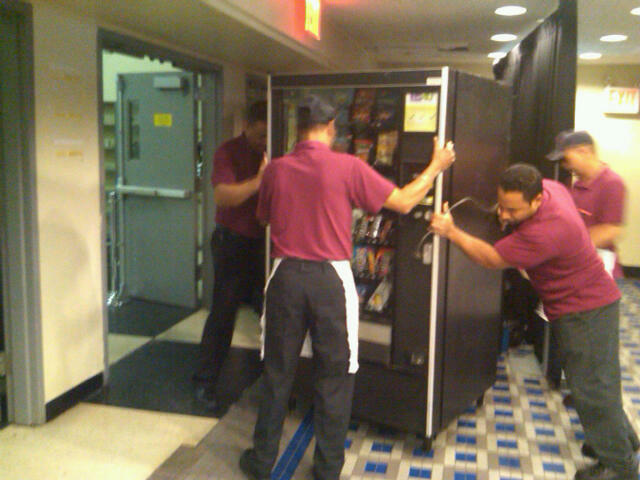 When the hours of the UN cafeteria were cut, they put potato chip and soda machines in the lobby for the other hours. Now these machines have been moved inside the cafeteria: locked up in the off-hours the machines were supposed to serve. Likewise the small bar purportedly filling in for the closed-down Delegates' Lounge is rarely open. "Ban Ki-moon and Angela Kane have sucked," a well placed commadic UN staff source said, "the life out of the UN."